Travelators handy toilets a bit far. Queuing was somewhat long but I was able to tolerate it. Staff friendly but not very helpful. Upon exiting tried to look for shuttle bus to go to our hotel and staff told us to wait. After 45 mins the bus did not came. Apparently we had to call the hotel but the staff did not give any information about it. Clean fair number of facilities but could be better. 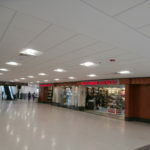 During the freeze of December 2010 in the UK and being unable to fly directly from London to Barbados we were re-routed via Miami Airport. Even though we were passing through Miami in transit - in other words we had no intention or desire to enter the USA we were forced to queue at immigration and treated like criminals having our fingerprints and photographs taken. The next obstacle was that although our luggage had been booked through to Barbados we had to retrieve them and queue once again at customs for almost an hour. Once we had passed through customs the real hell started. Airport officials kept on shouting at us in Spanish and one particularly charming one shoved me to the ground. Finally someone translated for us that we needed to push our luggage through a barrier to get them on a conveyer belt to our onward flight. The rest of the process getting on to our flight to Barbados was not much better. We are an elderly couple in our 60s who travel a lot we will certainly never attempt to go near the USA again to be exposed to such humiliation. 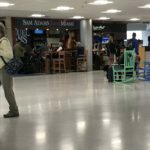 Suggestions to Miami airport - Transit passengers should remain in transit and be transferred directly on to their onward flights. Ensure that airport officials are able to speak English! Train airport officials rules of courtesy and politeness. Arrived Saturday 24 July from London and was pleasantly surprised by how easy the passage through immigration was. Short queue and through to collect baggage which was waiting for us. The walk from plane to immigration was longer than expected but when compared with Atlanta where we as family have waited over an hour after passing through immigration for bags to arrive this was much better experience. In all some 45 mins from landing to being on the shuttle to collect the hire car. Traveled home on 11 Aug no queue at check in and access to fast track through security made it very easy. Used the Club America F lounge very spacious and clean. Perhaps we were lucky but overall our experience of Miami from an arrival/departure perspective was very positive. With building work still going on it's a mixed bag. International arrivals & immigration (as UK citizen) O.K. Easel in immigration with poster saying Arrivals with arrow then confusingly lots of corridors with signs to immigration!? Eventually picked up signs for Baggage Claim. Domestic arrivals okay except for truly appalling baggage claim carousels - just inside roadside doors where anyone can come and grab a bag. Have they learned anything from Phoenix? Check-in average poor where there is building work. Airport seems to be getting its act together but be prepared to walks miles! Mixed review here. Arrived mid afternoon on CO. Signage is horrible. Followed signs for ground transportation - but no. Hotel shuttles are upstairs. Try and find an escalator to go back up. Then waiting on outer curb under 'Hotel Shuttles' sign only to notice all hotel shuttles are on inner curb. Check in for departure easy and fast lane at Security meant we were there only 10-15 minutes mid morning. Nice selection of shops on concourse but eating was limited. Nightmare. Arrived at 0635 for a 0800 NW flight to MDW via DTW- hundreds in line. Self- service kiosk could not provide boarding pass (tried all 3 methods of accessing) with instruction to "see an agent". 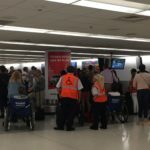 No airline personnel were available to help passengers (there were many with the same problem with kiosk) only airport personnel ; one of whom just shrugged and walked away. Angry very vocal crowd! We waited 4.5 hours in line obviously missed flight. We were rebooked on a 1425 flight to ORD. Happy to get out of Miami; however since my car was at MDW I had to pay $16. bus fare to MDW and then a 2 hr drive to my home in Michigan. Not one Delta or NW employee could explain the problem. There did not appear to be any weather delays or cancellations posted on monitors. I cannot understand why this airport checks in international passengers as well as domestic passengers in the same lines. Entire families traveling to South America or Asia needed translators which of course meant all others had to wait until a translator could be found. Unbelievable. Another customer in line with me wanted only to check his bag - he had a boarding pass. He said he was at airport at 0616 for 0715 flight and only wanted to check his bag. Curbside checkin was a disaster with long lines and then closing down so passengers then had to go inside and get at end of long long lines there. ORD and MDW work in a professional efficient courteous way. 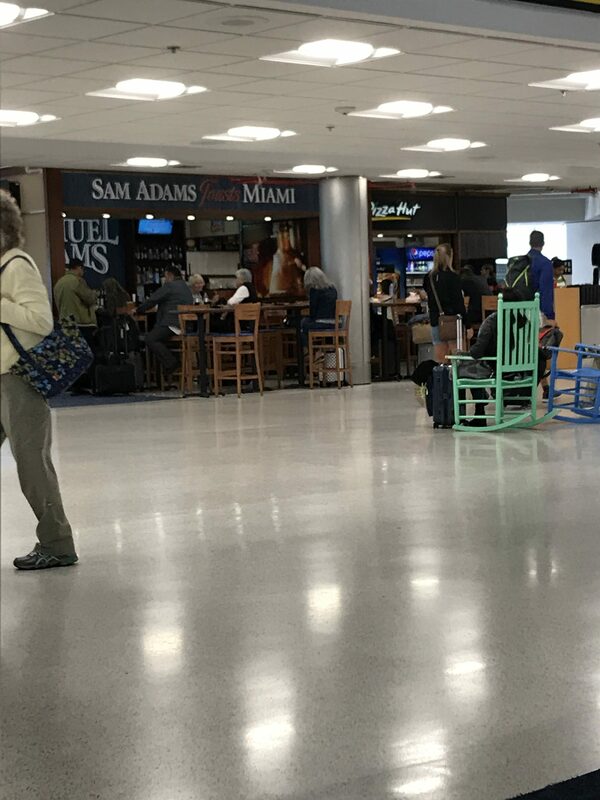 Never will I go near Miami airport again. 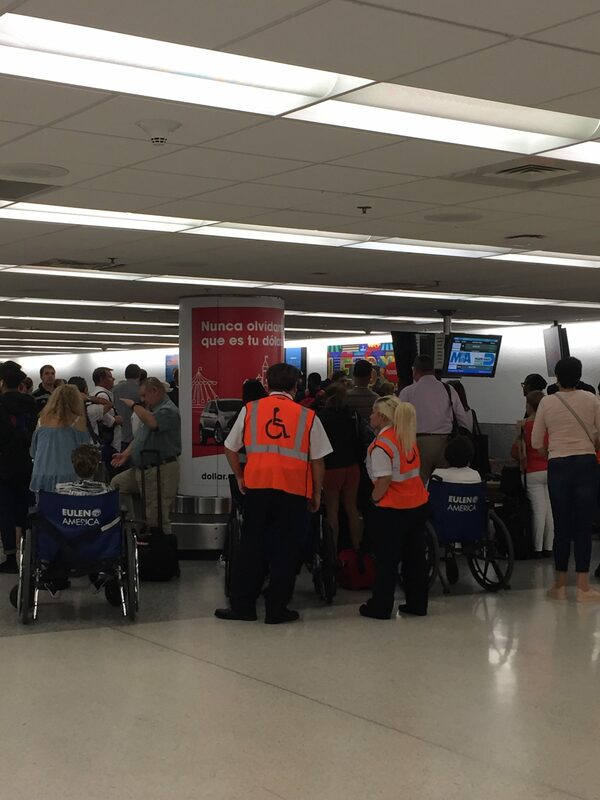 Sad thing is that no one could or would assist passengers and I truly doubt corporate Delta could care. Great improvements at MIA with the opening of the new South and North Terminals - great shopping stores food and beverage and services. Short security lines good signage and pleasant employees. Overall great improvement at MIA since three years ago. Had to change planes in both directions on an international trip. The airport appears to be in a constant state of construction with areas blocked off at various locations. Waiting areas at the gates were rather small and overflowing with people. Limited shopping after passing thru security. Food selection was slightly better and I could not find a single hamburger stand. On the return flight I had to go thru customs and passport control. After a long walk to passport control there were nothing but long lines (10 to 20 deep). Baggage claim was also packed and again with long lines. I will try to avoid MIA in the future if at all possible. On arrival short queues 4/5 long at non-US desks but staff directed people to US citizen desks as some of these were free. Immigration staff unsmiling but not unpleasant and through customs in no time at all. On departure no queues at all at security and AA lounge quite pleasant to pass an hour in. 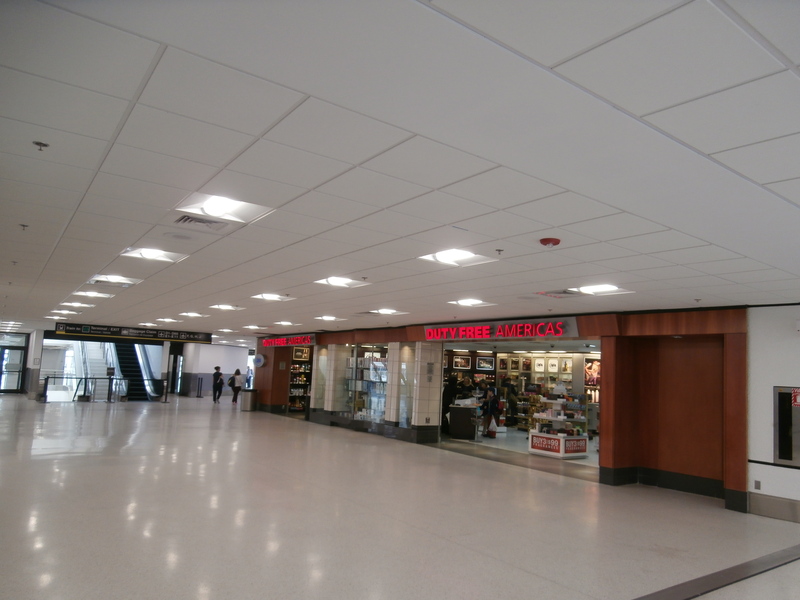 Not many shops airside but reasonable eating facilities.